Magical realism adds its rainbow colors to the twenty-two first-person pieces that interweave to tell the story of a group of people living in Austin, Texas at the turn of the millennium. The six main narrative threads overlap and entwine around the idea of love in its myriad forms. Aqua Vitae Café, deep in the funky heart of South Austin, is the central connection—although the settings range from Austin to New Mexico to Guatemala and Honduras. And through it all, the Prophet Mudcat signs his siren songs, trying to usher in the Age of Aquarius by returning humankind to the water . . . Published by Ink Brush Press in 2010, Andrew Geyer's second story cycle was named runner up for the Starcherone Fiction Prize. This is a DAZED AND CONFUSED with teeth, for Geyer shows the consequences of confusion. In his Austin, people had better keep their hopes and their fists up, because their luck and their lives can go horribly wrong . . .
Read this wonderful book and you will understand better the practice of love. There's the Prophet Mudcat singing his lightning bolt revelations in Barton Springs Pool, a Mexican grandmother being pursued by a man who loves her while she deals with a grandson who may be a murderer, a single mother struggling to pay the bills and give care to her autistic son, and a young professor on lousy adjunct pay trying to hold his family together in highly inflated Austin by moonlighting at the Aqua Vita Café. That's just a sample of the polyglot weaving in and through this inventive and delightful story cycle—a siren song from the heart of Andrew Geyer to the reader. Geyer cares for these characters and shows us that even though they may appear Austin weird, they're just ordinary people who provide, amid their daily struggles, the miracles of ordinary love. 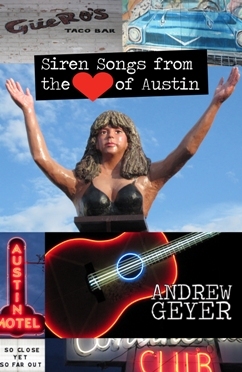 Like that other great love letter to the city of Austin, Texas, Richard Linklater's SLACKER, Siren Songs from the Heart of Austin focuses on many characters, all with different stories and perspectives on life. Unlike the former, though, Andrew Geyer's collection of stories re-visits characters, and develops them in a much more novelistic style. The twenty-two stories blend magical realism, literary and Biblical allusions, and poetical prose into a book that is more than the sum of its parts; the reader is walking the streets of Austin, visiting the settings of these stories, interacting with their first-person narrators. A range of emotions fills the pages—rage, lust, envy, regret, love—and readers will find themselves laughing at one moment, and deeply moved the next.